The aim of this guideline is to provide evidence-based recommendations for registered nurses, registered practical nurses and other health-care providers to facilitate client centred learning that promotes and enables clients to take action for their health. Regardless of how client centred learning is framed (self-care, self-management, client teaching, client education, health teaching) the recommendations and related strategies can be used in any setting across the continuum of care. However, this best practice guideline focuses on adults over the age of 18. The needs of children and youth, related to developmental stages and learning, is beyond the scope of this guideline. Specific strategies to facilitate learning in special populations and accommodation to disabilities are also beyond the scope of this guideline. 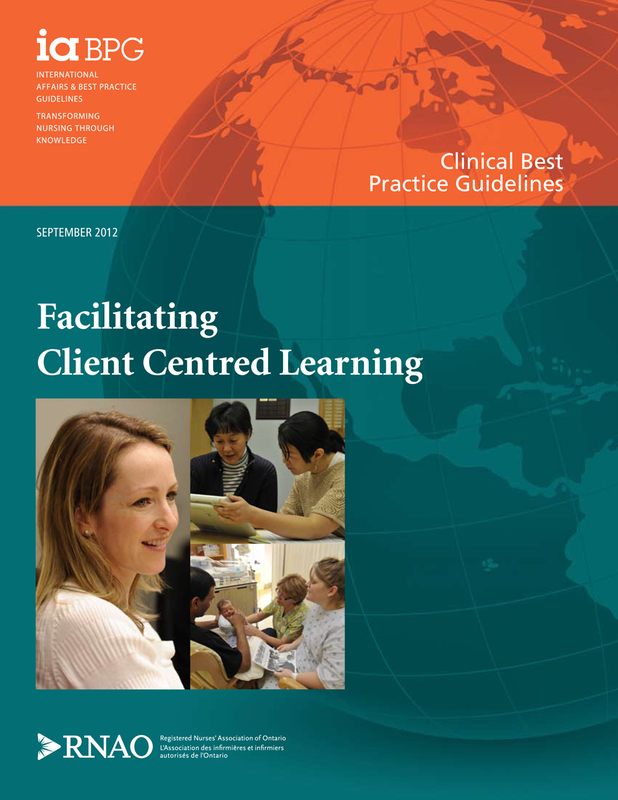 How can nurses effectively facilitate client centred learning? What are effective teaching delivery methods/strategies for client centred learning? How do nurses assess client learning? See the recorded webcast of the guideline launch.